Well looks like my hot takes from last month are already starting to crumble. Let’s take a quick run through before we go into MLS Goalkeeper of the Year Power Rankings. 1. Luis Robles and David Ousted will duke it out for Goalkeeper of the Year again - Off to a rough start to say the least. I wouldn’t count them out completely, but the first month was definitely not kind to them. Expect them to turn it around, but it will take a strong push to get them in the conversation for a second year. However, play across the board has been thin by the majority of goalkeepers so maybe just maybe. 2. Dykstra will make people momentarily forget about Bill Hamid - Well the injury definitely was not kind but there could be some time for Dykstra to start before Hamid gets back to 100%. The jury is still out on this although they are all heavily leaning “no” at the moment. 3. Tim Howard will have a forgettable year - The 2-0 loss to Guatemala isn’t helping his case, let me just say that. 4. Sean Johnson starts seeing his way out in Chicago - The strongest prediction as of right now. There’s been rumors of wrist injuries but it seems he’s been on the bench mostly due to a coach’s decision. Even if Johnson does top Matt Lampson in the depth chart, don’t count out Patrick McLain. At this point, I’d expect McLain to get a game over Johnson. 5. Philadelphia and Los Angeles’ goalkeeping woes continue - Andre Blake is red hot right now but knowing Philadelphia juju, it seems a strong possibility that they will sign four more goalkeepers and Blake willl pick up a knock sooner than later. Rowe is sitting even keel between boom and bust right now but to be honest, all of this doesn’t matter until playoffs come. That will be the make or break for these teams. There is a thing that constantly steals my interest when it comes Major League Soccer. It's how teams choose to scout and evaluate talent that is already in the league. One thing that has been made quite clear with the financial constraints is that it is difficult to hold on to those players that hover around the $200,000 salary threshold, and yet aren't stars or obviously consistent difference makers. Player makers such as Chris Rolfe, Mauro Rosales and Bobby Convey have found new homes in MLS, either in the few months leading up to this season or since the first kick. The names themselves aren't specific references of importance, but rather examples of what happens in the off-season concerning players in the aforementioned pay range that are just casualties of cap situations in today's era. These players we understand to a degree. They are interesting talents with a fair amount of room for critiquing, whether that be due to personality, problems with injuries or just inconsistent displays of performance from week to week. There are always one or two or even three (in this case) of these players that are available come the off-season. Two of the three players went to clubs with the ability to take chances. Chivas USA was obviously getting a steal in adding Rosales. Super Mauro, since being added to the roster, has accrued 17 key passes and 3 assists while producing 12 shots on his own. He leads the club in Total Shots Created. DC United needed anything to help save their season and jump start their offense. The arrival of Rolfe in return for a bit of allocation money was seemingly a worthwhile risk--and his influence on Ben Olsen's chances of keeping the head coaching job can probably be debated to some extent. Prior to the trade, Olsen and DC United had only produced 1 point through 3 matches. 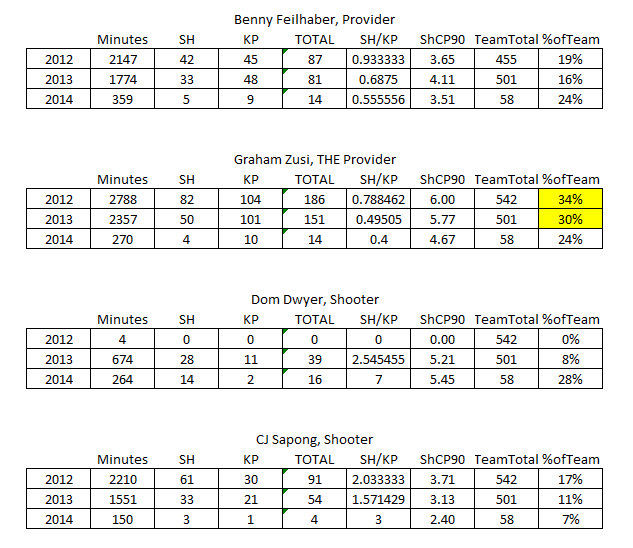 Since the addition of Rolfe, they're now rolling at nearly 2 points per match. Now, I'm not saying that Rolfe is truly responsible for the turn around. That idea would represent lazy analysis. In fact, DC United generated 34 shot attempts to its opponents' 36 in the first three games, and 108 to 112 since, so it's not like Rolfe's presence has indicated a stable improvement yet. Frankly, since MLS week 4, it's been the Fabian Espindola show at RFK, and that is a completely different discussion. On to Convey, who didn't go to a team that had to take on a lot of risk. Instead he went to the defending Supporters' Shield-winning New York Red Bulls. He has been somewhat of middling attacking influence in his time on the pitch for the Bulls, adding 9 key passes and 2 shots in just under 700 minutes over his initial tenure this season. WhoScored isn't exactly impressed. They have graded his performance so far by issuing him a 6.39 rating which is well below their league average rating for a player---which sits near 6.7. Squawka ranks him 16th on the roster depth chart which mostly follows up that thinking being that WhoScored placed him 15th overall. These three players represent teams that have taken advantage of a system available to them in an effort to improve their club. What is intriguing to me at this juncture isn't necessarily the impact they've made upon their current club but how their current clubs targeted them as being upgrades and financially worth their investments. I'm sure that MLS teams have personnel that help front office types make decisions and help discern player talent and ability that make them right for the acquisition. I am familiar enough with certain clubs to be aware of the individuals that are involved in that process, and much of it seems archaic and awkward in method. Mauro Rosales may have been less of a risk when it comes to Chivas. In fact it was kind of "duh" type moment that perfectly fell in their lap. The other side of the coin is that Rolfe and Convey were both risks, and heavy ones at that considering their price tags (before New York lapped Convey up, that is). I would certainly concede that all are substantial talents within the US first division. But how they fit the rosters to which they were added to is a bit interesting. Some could point to Convey's addition to New York as an attempt to add competition to the left side and some wide play making, Convey has instead shifted to the back line in the form of a full back. Which begs the question, was that the idea before he was added? I, as well as many, had thought Luis Silva would be taking over the role of central play maker in Washington after the departure of Dwayne De Rosario. After the stumbles by Silva early on, I thought that Rolfe would take over that role, but instead he looks to be pushed out wide with Nick DeLeon, being featured more frequently in the central attacking role. Was this a decision made before acquiring him, and did the club think he could fill that role any better than some of the more natural wide midfielders who have moved clubs since? Results-based analysis is often unhelpful, and in these cases, don't truly tell the story we're seeking in how MLS teams are valuing these types of players. I'm curious if there are any specific statistical values that teams could point to as to why they made this move--and please, I hope it's more than the assists or goals totals, or the fact that they're "winners." For all the talk about transparency in details for the league, it would be nice to see some of the true thought processes involved in analyzing these talents beyond tired cliches. Especially considering that all these clubs they have access to far better gauges and methods than what most of us have at our disposal. As you might have seen from our twitter stream, I kind of wrote an article on DC United last night. Then I scrapped it. Then, Alex Olshansky dropped this brilliant mess concerning Michael Bradley, and I was like "that's basically what I was doing... on a team level!" So it kind of nudged me to at least put forth an effort to finish it...only not really. 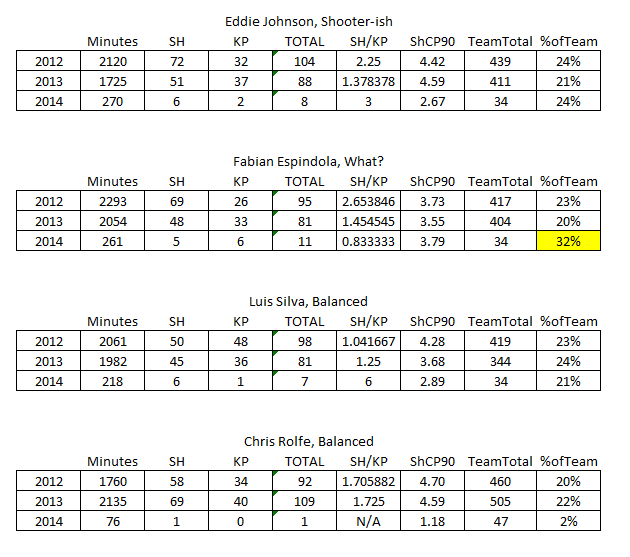 What I did was basically compiled stats for four "core" attacking players on three different clubs. Two of those clubs (Sporting KC and Houston Dynamo) have shown consistent success the last two years, while D.C. United...well, you know, they have kind of stunk the place up. The rest I submit to you without further inane commentary. Today, I was asked simply, which team has the best pairing in MLS? It's a good question, and oddly one that I've been asked a lot and. Despite the frequency of requests, it's something that I have trouble answering. There are a lot of ways to measure performance for attacking personnel, but due to my time restraints I found the easiest way to do this was to go to Squawka and use their attack score. Below is a listing of teams and their two highest* attacking score combos. 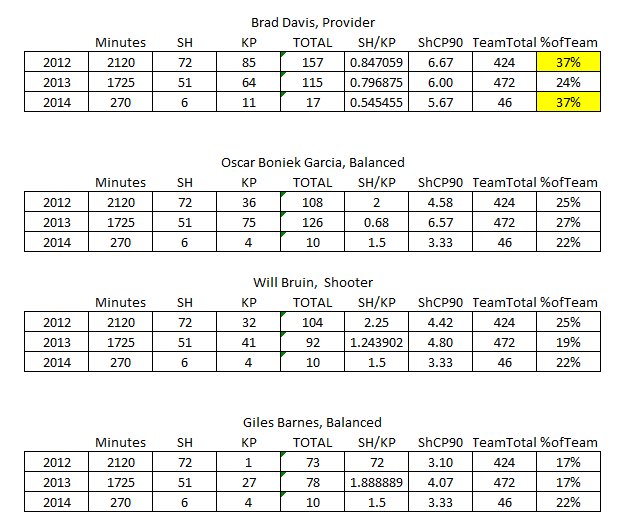 Since it's a purely cumulative stat I pro-rated it to 90 minutes. As you probably wouldn't be shocked to find out. Mike Magee, Landon Donovan and Federico Hinguian round out the top-3. There are a couple of key individuals missing from this list that may or may not "pop out" at you. The first is Philadelphia's top goal scorer Jack McInereny. Part of this is due to his missing time with the Mens National Team during the early rounds of the Gold Cup tournament. The other part is that outside of his bunches of goals scored early in the season he hasn't done much else with his time. The other name, though less likely to be spotted, is Luis Silva. Since arriving at DC United, he's posted the top overall score determined by Squawka, as well as the highest rating on Whoscored, with his new club. However, he's only played 5 games and a total of 420 minutes for DCU, so it's a small sample and I decided to drop him from the listing. This lowered DC United's end score rather dramatically and yet corresponds quite well with whatever combination player they might be able to muster. Now, taking all those dynamic duos and adding them together gave us a combined score of the two best attacking players on each team. Here are those in order. It's not a surprise to see LA at the top of any such list. Robbie Keane and Donovan have long be herald as the best dynamic attacking duo of the league. But if you are looking beyond those two the teams are rather surprising. Vancouver, Chicago, Columbus and Philly all make up the top-5 with the often scrutinized Obafemi Martins and Eddie Johnson contributions falling just outside the grouping. Another interesting note, taking us further towards the discussion of single best player. While individual performances matter, it's about team accomplishment rather than singular performances over the stretch of the season. It's obvious that while Chicago and Columbus both have had outstanding performances from their key men up top, they are lacking something on a team level such that these individual metrics don't correspond entirely to the tables at the end of the day.